We always see how celebrities’ homes look so extravagant and luxurious, thinking that our home will never be able to look like that. However, that’s not true! With the right ideas, design, and renovation, your home can also look as expensive as the Beverly Hills mansions. Here are some tips that can help you start off. 1. Dress your walls up! Get in touch with your inner artist, and try dressing your walls up with wallpapers! Luxury doesn’t have to be simple or plain, and wallpapers have many intricate designs that will allow you to express your creativity in ways that cannot be done through tiles or stones. Of course, be sure to use the correct type of wallpapers that are designed for bathrooms. Here’s a tip. 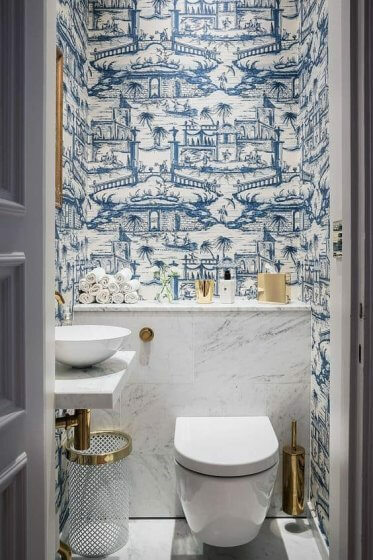 When using bathroom wallpapers, be sure to not go overboard with them, and try to create a focal point by only putting wallpaper on one wall. You should also try to avoid putting your wallpaper in areas that get wet easily or frequently, such as the shower area. 2. Don’t settle for basic lighting. Sure, a dim bathroom that’s illuminated with candles sound pretty romantic, but for most times, a dim bathroom is far from pleasant and will look like it came straight out of a horror movie. Keep your bathroom well lit, and if possible, maximize your use of natural lighting. Otherwise, make sure that your light fixtures are placed strategically and keep your bathroom well lit, but not overly blinding. To elevate the luxurious feel, you can also choose light fixtures like chandeliers or wall sconces. Get interior design guidance from professionals if you can’t make up your mind! 3. Mount your basin on the table, not the wall! Instead of settling for the default wall-mounted basins that most houses come with, you can change up the look of your bathroom by changing the basin! Table-mounted basins are a common type of basin that is easy to install and are rather common as well. However, having your basin mounted or a wide countertop can help your bathroom look more luxurious and modern. 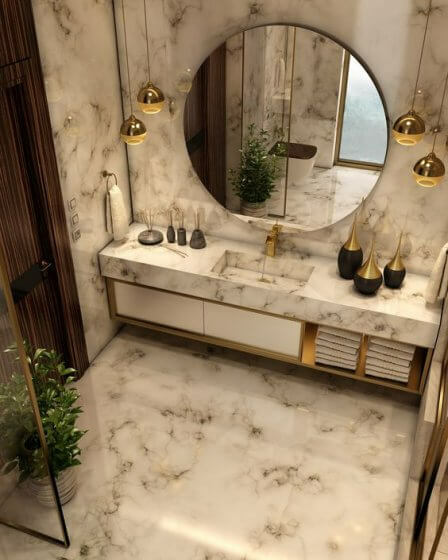 To elevate the luxurious mood in your bathroom, you can also opt to mount colored-ceramic, marble, or wooden basins onto countertops for that Beverly Hills rich kid look. 4. Keep yourself contained, but not hidden. Shower stalls are not uncommon, and many people opt for framed shower enclosures that are economical and traditional. However, aesthetics don’t need to be sacrificed for practicality! Instead, use frameless shower stalls, in which the door is essentially made out of a huge piece of glass that comes with a hinge. This will give off a more spacious and airy feel because of the amount of light that can be passed through. If you’re worried about cleaning – don’t worry, it’s relatively easy to clean. You can also get in touch with professional cleaners to help you out with cleaning up your bathroom. 5. Choose the right flooring material. From ceramic tiles, waterproof vinyl flooring, natural stones, laminate flooring, to engineered wood – your bathroom’s look can change drastically depending on the type of flooring material that you choose. When made use of properly, all flooring materials can reflect luxury. However, natural stones are generally more aesthetically pleasing than the rest, especially marble, granite, and limestone. On the other hand, when it comes to practicality, ceramic tiles can be found in all sorts of shapes, sizes, colours, and patterns. It allows you to have more freedom when it comes to creating the look that you actually want. 6. Mirror, mirror, on the wall. 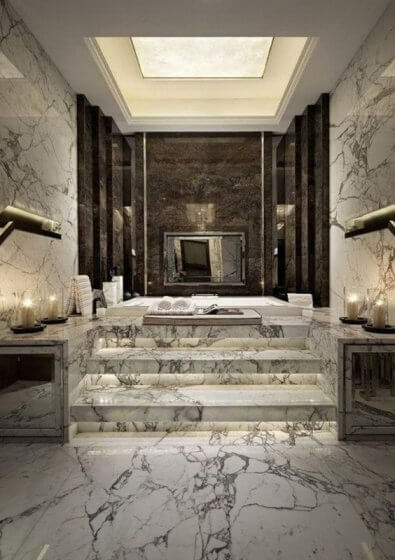 To achieve the luxurious look, it’s important that your bathroom is spacious. 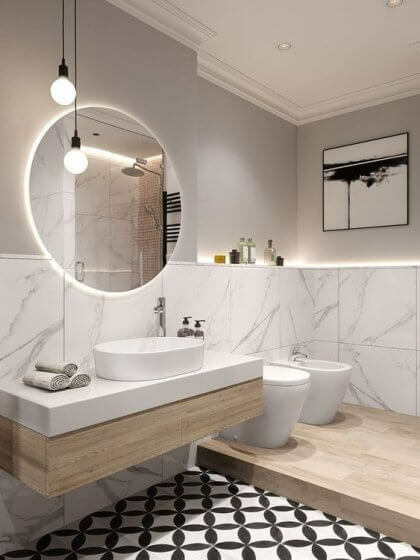 If you have limited space to work with, you can make use of large mirrors to create the illusion that your bathroom has more space than it actually does. Get creative with the shape and size of your mirrors – they don’t have to be rectangle or square! 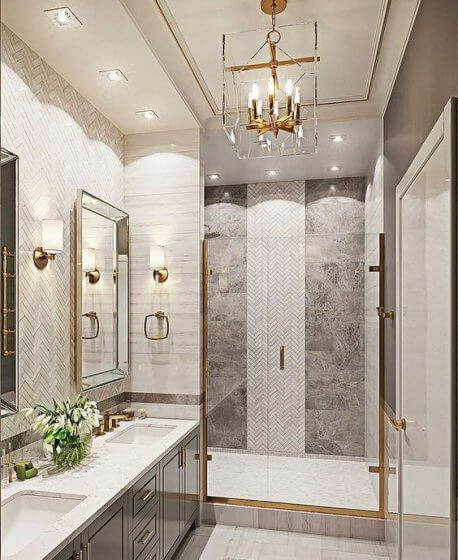 Your bathroom may not be that place in your home where you spend most of your time, but it’s a place that lets you wash away all the fatigue from a long day. Get in touch with renovation experts on Gawin to make your dream bathroom come true!